Saturday Night "Free for All"
There are no events that match for this day. 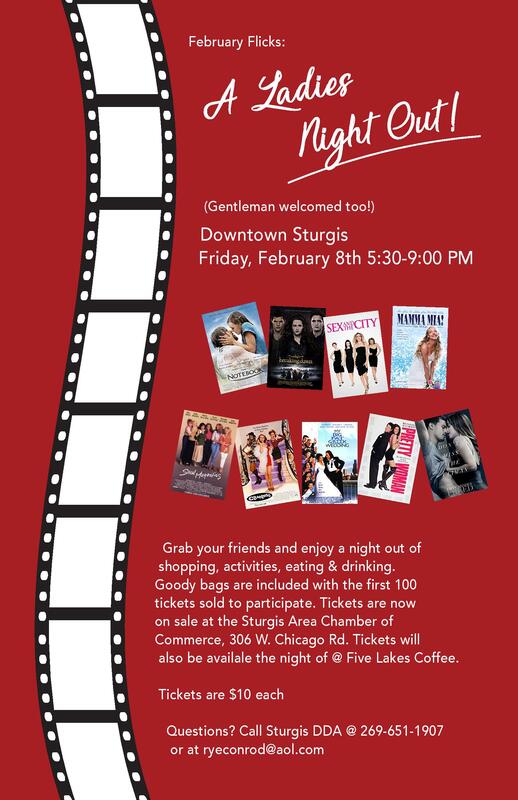 Get your girl or guy friends, grab a goodie bag and enjoy an evening of "Chick Flick" themed movies in participating businesses with food, beverage, activities and prize drawings! 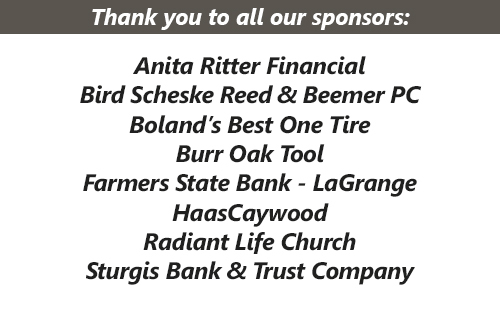 Tickets are on sale now @ the Sturgis Area Chamber of Commerce for $10 per person. Tickets will be available @ the door @ Five Lakes on February 8th @ 5:30pm. This is a registration event for youth spring soccer thru SYSO. We are having our first sign up at the Library. 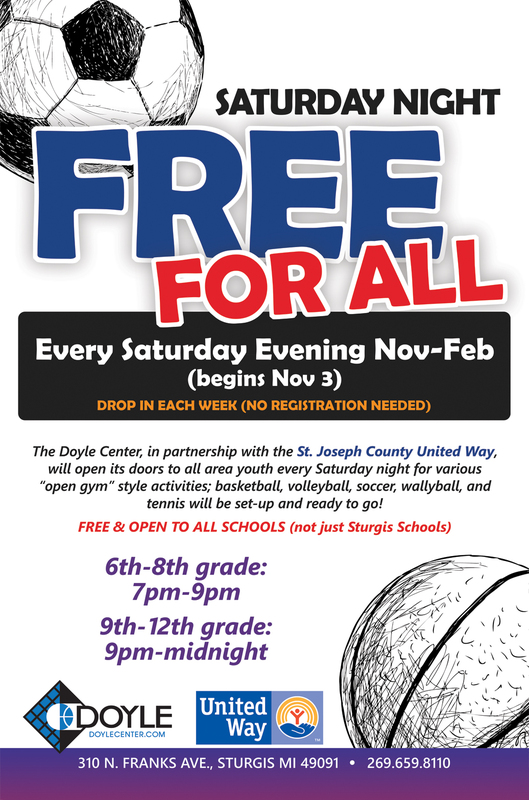 In partnering with the St. Joe County United Way, the Doyle Center is proud to open our doors to ALL area youth in grades 6th-12th all winter long on Saturday nights. "Open Gym" style format including Basketball, Volleyball, Soccer, Tennis and more! Come in and play or just hang out and socialize. 6th-8th Grades: 7pm-9pm 9th-12th Grades: 9pm-Midnight FREE!!! Cost: Breakfast Buffet $10; Lunch Buffet $12; Brunch Buffet $14. 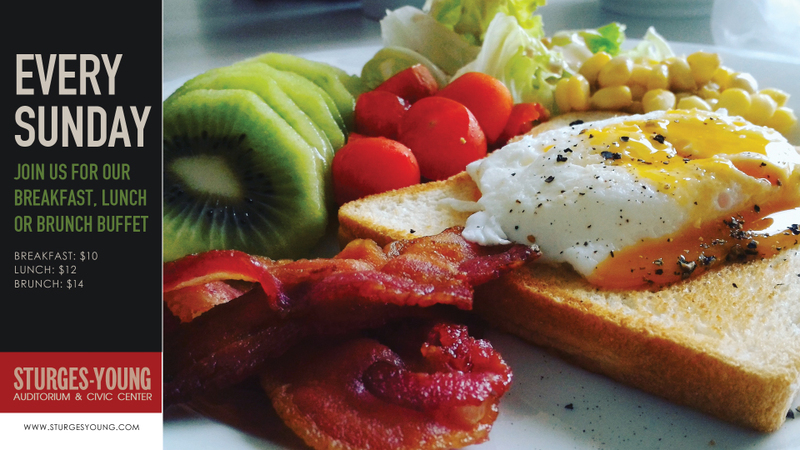 Breakfast is served 10:30-1:30; Lunch is served 11:30-1:30; Brunch is served 11:30-1:30. Groups of 9 of more should call for reservations. City Commission Meetings are held on the 2nd and 4th Wednesday's of the month in the Wiesloch Raum at City Hall, 130 N. Nottawa St. 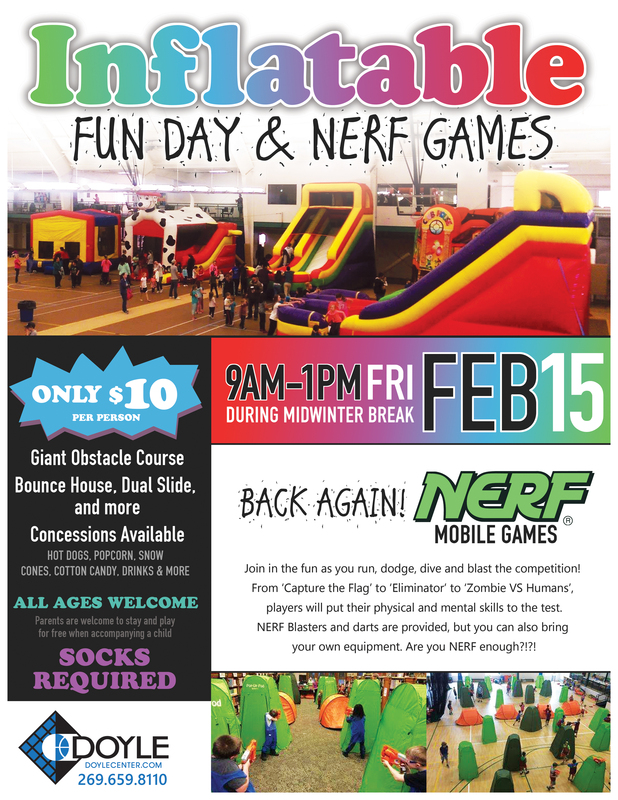 Giant obstacle course, bounce house, dual slide and more! Join in the Nerf games too! Only $10 per person. 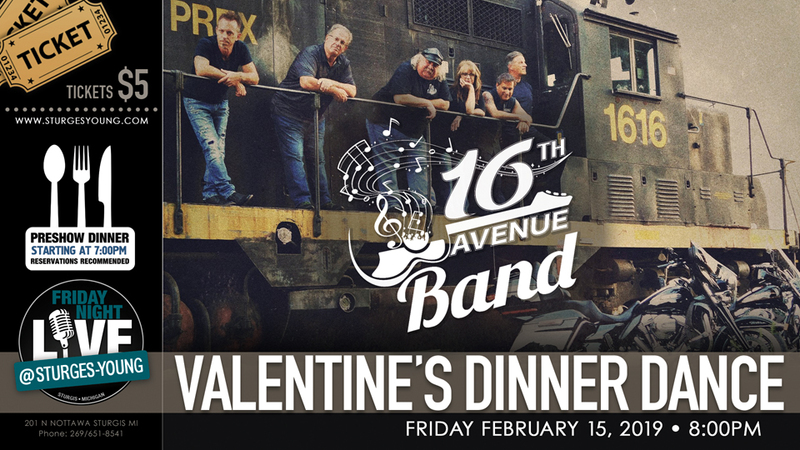 Annual Valentine's Dinner Dance featuring 16th Avenue Band! Call 269/651-8541 to make reservations. Music begins at 8pm. 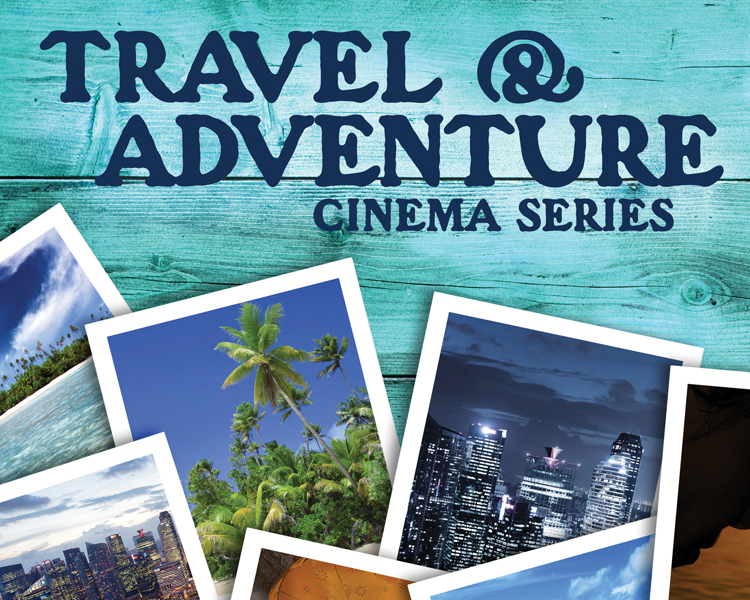 Join Lee's Adventure Sports and Camp Fort Hill for some outdoor winter fun. Learn to cross country ski or snow shoe, tour the Sturgis Log Cabin, hayrides, s'mores and more. The Planning Commission advises the City Commission on matters relating to the development of the City and prepares and recommends a Master Plan and Zoning Code for the City as scheduled and mandated by State law. Advisory Board dealing with airport matters; addresses issues of airport facilities and proposed improvements. The Auditorium Board is responsible for guiding policy of the Auditorium and promoting its use. Do you have special talent you'd like to share?? 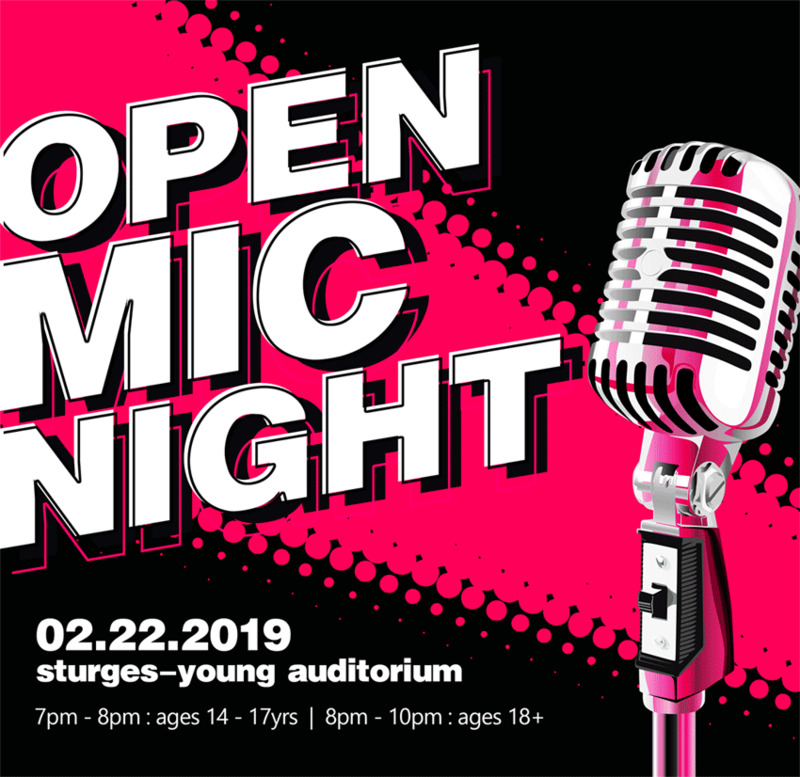 The SYA is doing an OPEN MIC NIGHT Friday, February 22. Performers age 14 -17 will take the stage in the lounge at 7pm for their max 5 minute acts**; age 18+ will perform their max 10 minute acts starting at 8pm. An amp & microphone available, if needed. FREE to perform and attend (donations are welcome). ** No profanity allowed during the 14-17yr time slot. 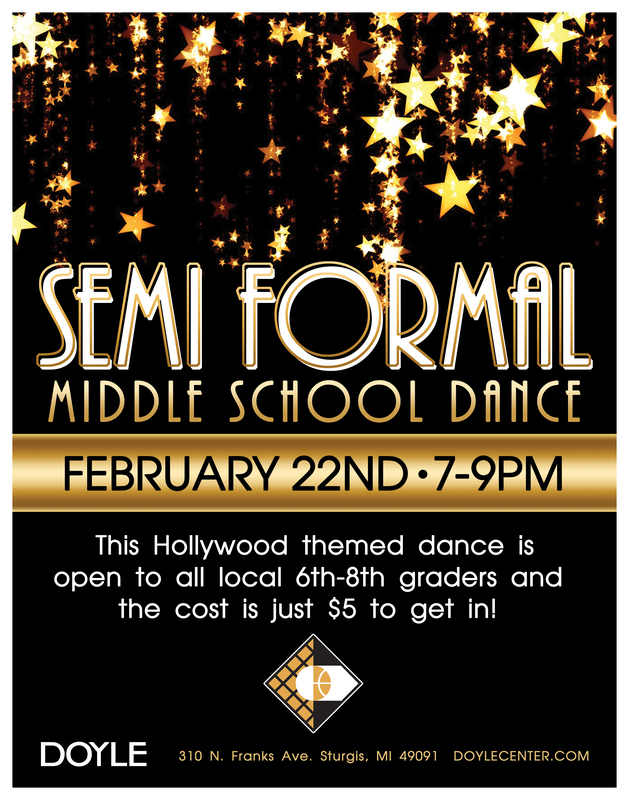 This Hollywood themed dance is open to all 6th-8th graders and the cost is just $5 to get in! Unregistered uses should use this option to suggest Sturgis area events for the Community Calendar. Please read our EVENT POLICY to ensure your event matches our criteria for inclusion - events submitted may not be considered due to content. Are you a Sturgis Area organization that regularly schedules events in the community? We suggest registering to become a partner to make your event submission even easier. You can also read more about how being a partner benefits you on our PARTNERS page. © Copyright 2019 Sturgis247 Calendar. All rights reserved. Website design by: eStudio Design, LLC.